One size fits most. Each style description will tell you what size the item fits up to. 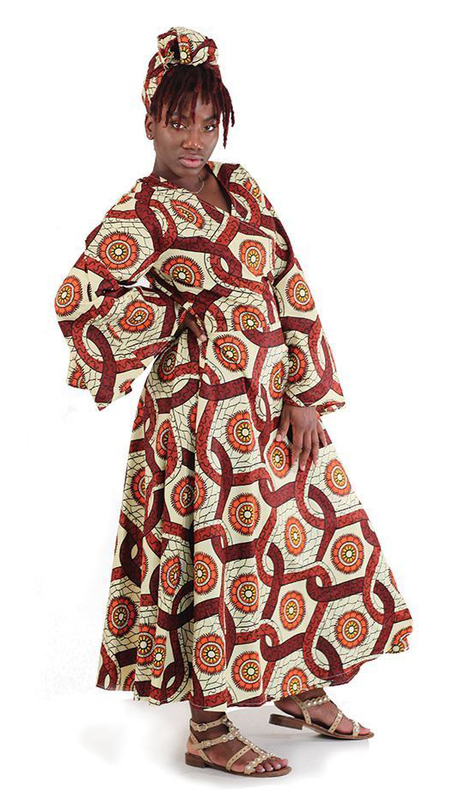 Coupons Do Not Apply To Any African Clothing. Circle Print HiLo Dress. The dress has halter top with straps and a skirt that is short in the front with a longer train in back. Comes with a matching headscarf. It is 32” in length in the front and 52” in length in the back. It fits up to a 40” bust and has an elastic back. 100% cotton. Polka Dot Jumpsuit. 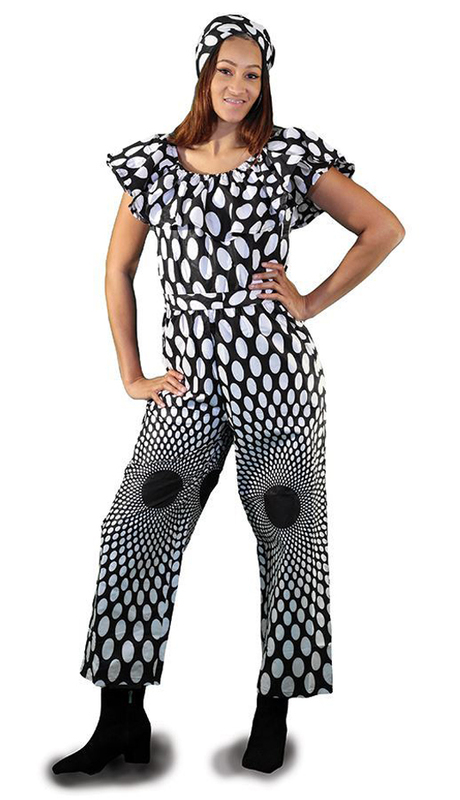 The jumpsuit has a ruffled neckline with short, ruffle sleeves and wide-legged, cropped pants. The pants are 58” in length with a 29” inseam. The top fits up to a 42” bust. Comes with a matching head scarf. 100% cotton. Polka Dot Wrap Dress. 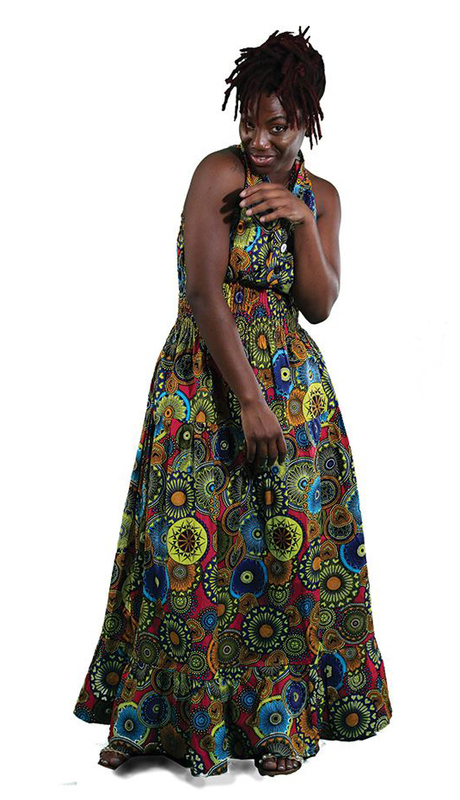 The wrap dress is sleeveless with a high, wrap around waist and skirt. The skirt flows to your ankle. It has a 58” length. Fits up to a 55” bust. Comes with a matching head scarf. 100% cotton. Peacock Long Button Dress. he dress has cap sleeves, four buttons down the front, an elastic waist, and a long mermaid skirt. The dress is 55” in length and fits up to a 46” elastic waist. It fits up to a 44” elastic bust. 100% cotton. 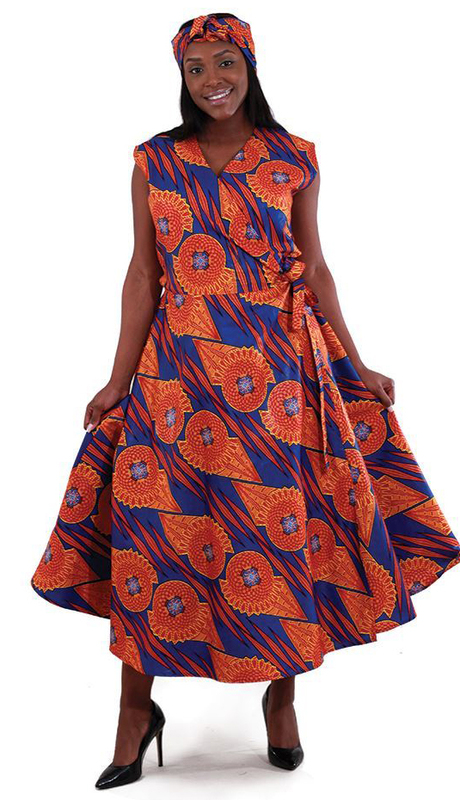 African-Made Pink Sun Dress. The dress has an off the shoulder, ruffled neckline and a godet skirt. The dress is 50” in length. It fits up to a 46” bust, waist and hips. 100% cotton. 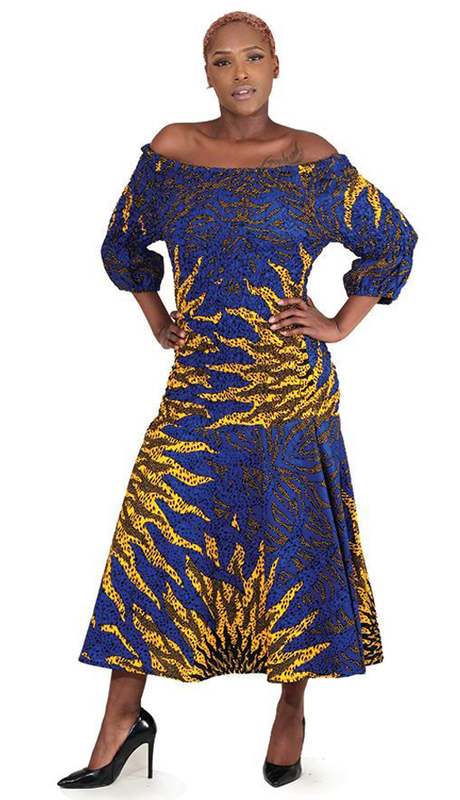 Traditional Print Queen Dress. The dress has an off the shoulder neckline, three-quarter length bell sleeves and a handkerchief hemline with a slit up the side of the skirt. The dress is 50” in length and fits up to a 40” bust. It has an elastic torso. 100% cotton. Blue Sun Elastic Short Dress. The dress has an off-the-shoulder neckline, three-quarter length peasant sleeves, a tailored waist and a circle skirt. 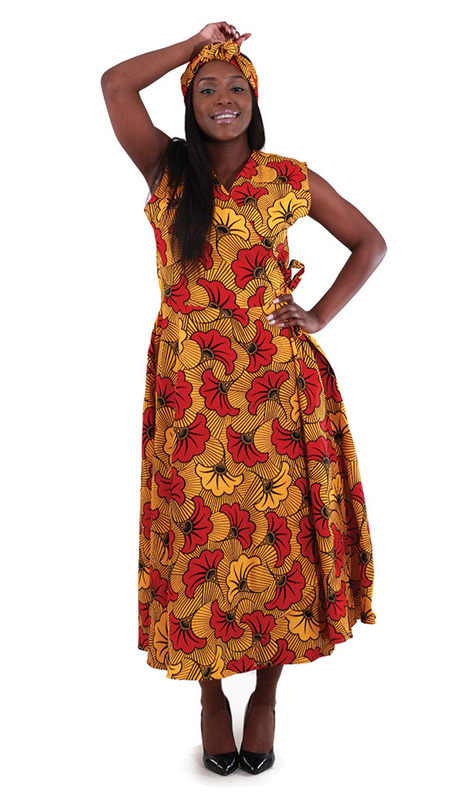 The elastic dress is 45-50” in length and fits up to a 42” bust, waist, and hips with 12” sleeves. 100% cotton. Circle Print Wrap Dress. 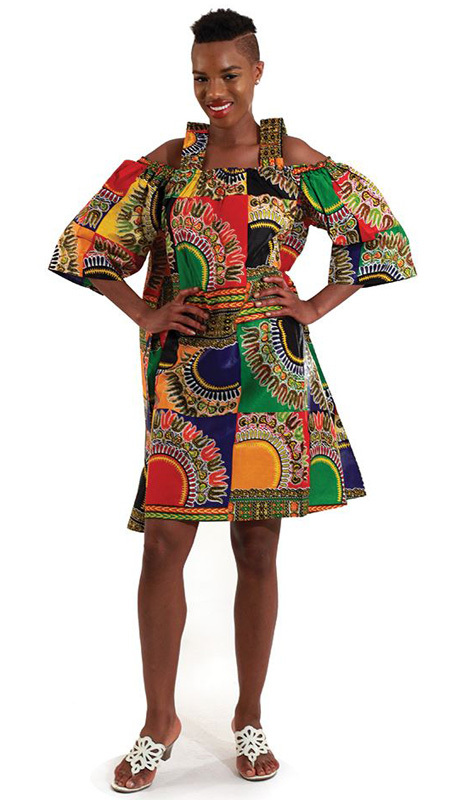 Stylish and bold this Circle Print Wrap Dress. The wrap dress has wide, bell sleeves and it wraps around your body. You tie it closed with 2 straps. Comes with matching head scarf. The dress is 50” long. It fits up to a 44” bust when tied closed. 100% cotton. Wash in cold water. 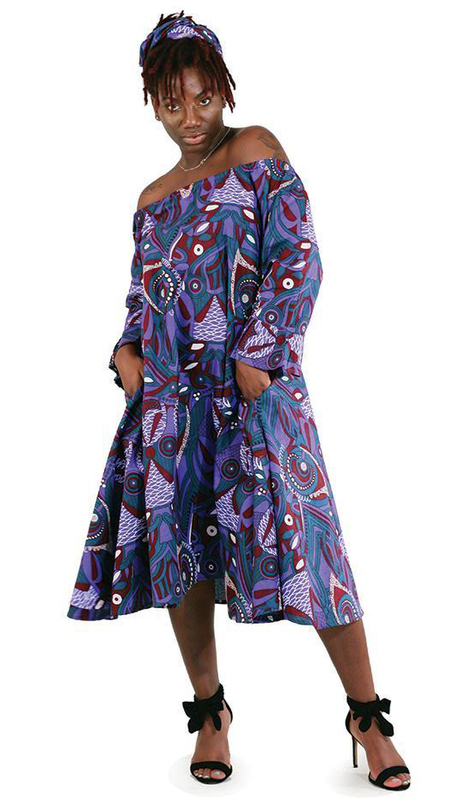 Western Print Wrap Dress. 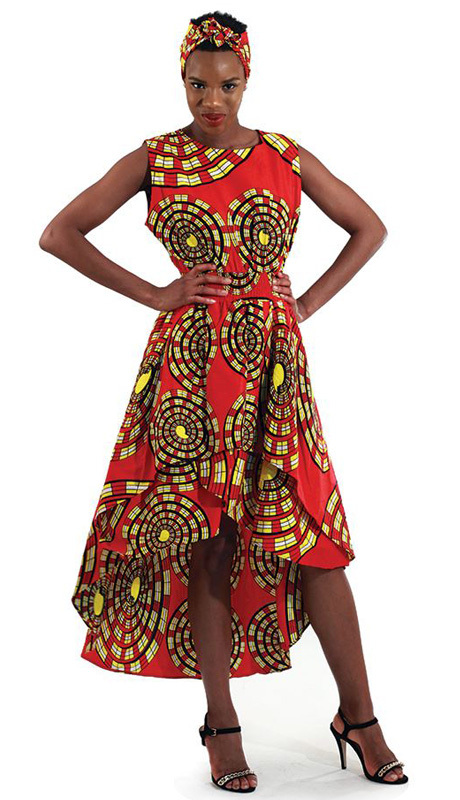 Stylish and bold this Circle Print Wrap Dress. 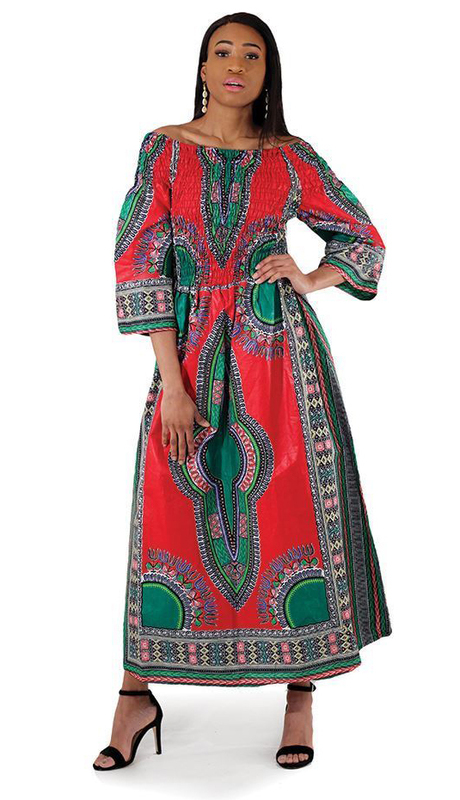 The wrap dress has wide, bell sleeves and it wraps around your body. You tie it closed with 2 straps. Comes with matching head scarf. The dress is 50” long. It fits up to a 44” bust when tied closed. 100% cotton. Wash in cold water. 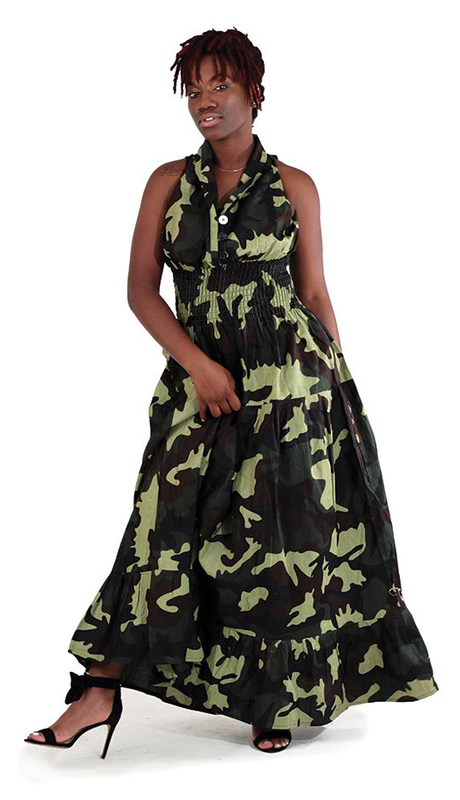 Green Camo Sleeveless Dress. Fits up to a 46" elastic bust with buttons. 60" long. 100% cotton. Wash in cold water. 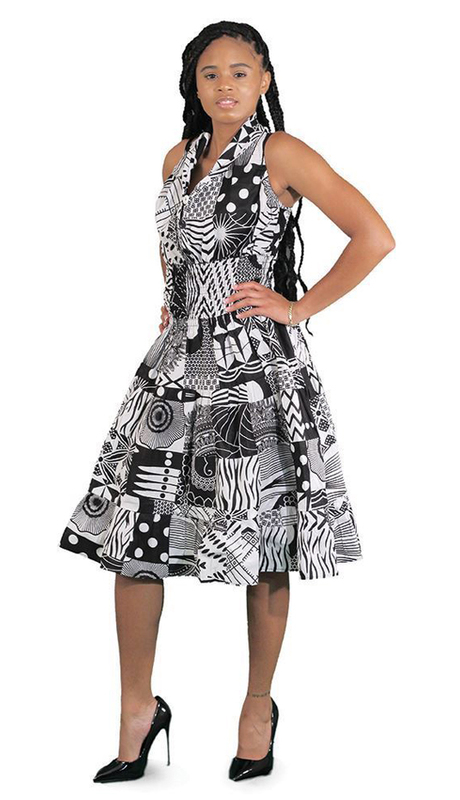 Sleeveless Zebra Print Dress. Fits up to a 42" elastic bust. 58" long. 100% cotton. Wash in cold water. Sleeveless Celebrate Love Dress. 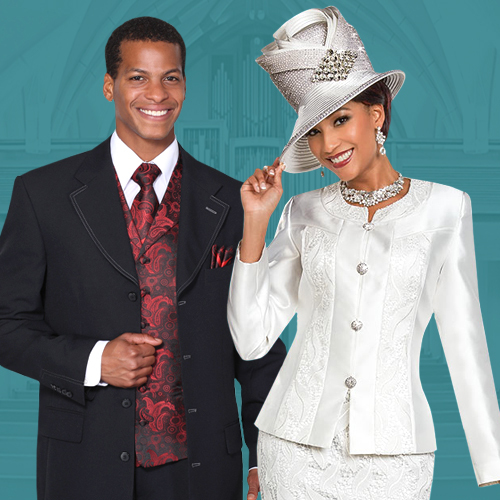 Fits up to a 46" elastic bust with buttons. 60" long. 100% cotton. Wash in cold water. 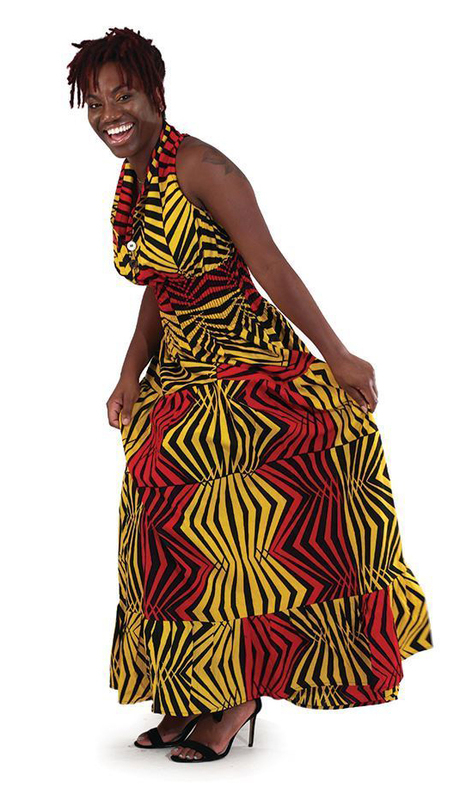 African Print Queen Dress. Fits up to a 46" bust. 43" long. Comes with matching head scarf. 100% cotton. Wash in cold water. 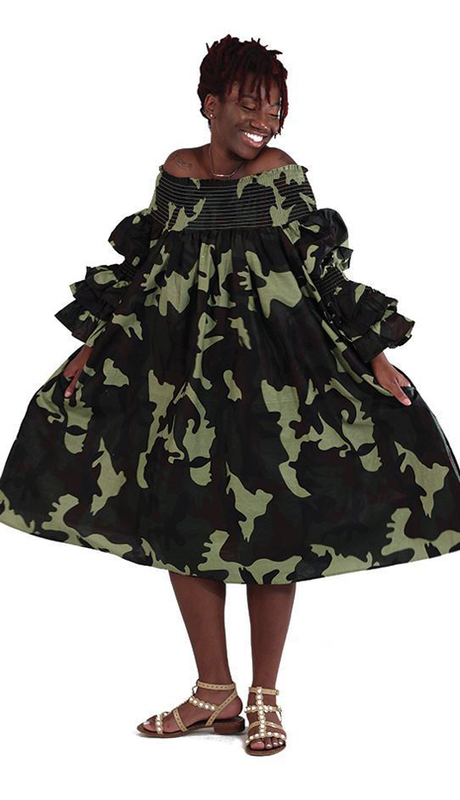 Green Camo Smocking Dress. Fits up to a 58" elastic bust. 36" long. 100% cotton. Wash in cold water. Swing Dress. Fits up to a 46" elastic bust. Has buttons on front. 42" length. 100% cotton. Wash in cold water. 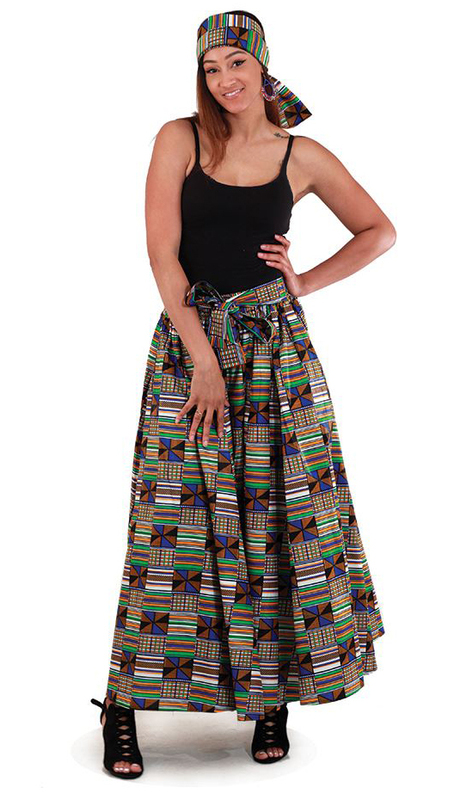 1pc Women's maxi skirt in kente pattern, two pockets and elastic waist with two tie straps. Fits up to 42" waist. Length is 40". 100% cotton. Comes with matching head scarf. 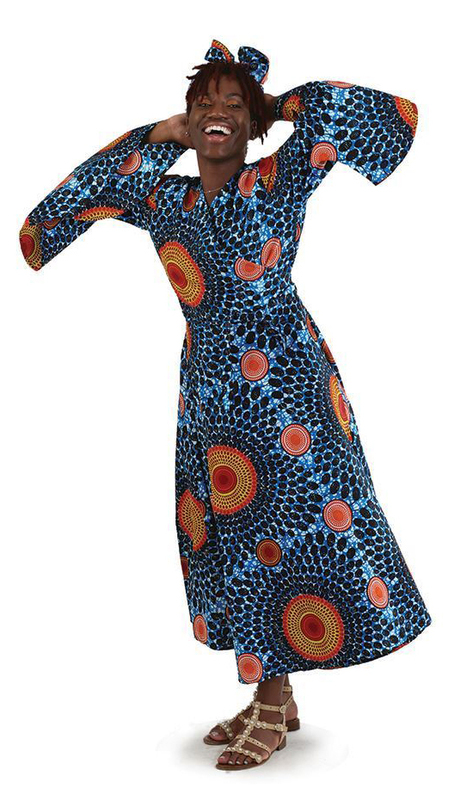 1pc Women's wrap dress in traditional african pattern, sleeveless with two tie straps. Fits up to 50" bust. Length is 49". 100% Cotton. Comes with matching headscarf. 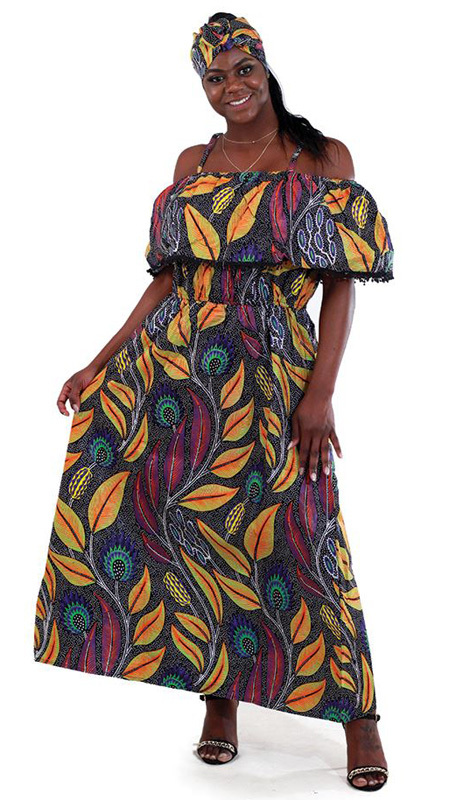 1pc Women's sleeveless wrap dress in traditional floral print with two ties at waist. Elastic bust 50". Dress length is 49". Comes with matching headscarf. 100% cotton. Hi-Lo Tier Dress. Fits up to 44" bust. 36" length in front and 52" length in back. 100% cotton. Comes with matching head scarf. Hi-Lo Tier Dress. Fits up to 44" bust. 36" length in front and 52" length in back. Comes with matching head scarf. 100% cotton. 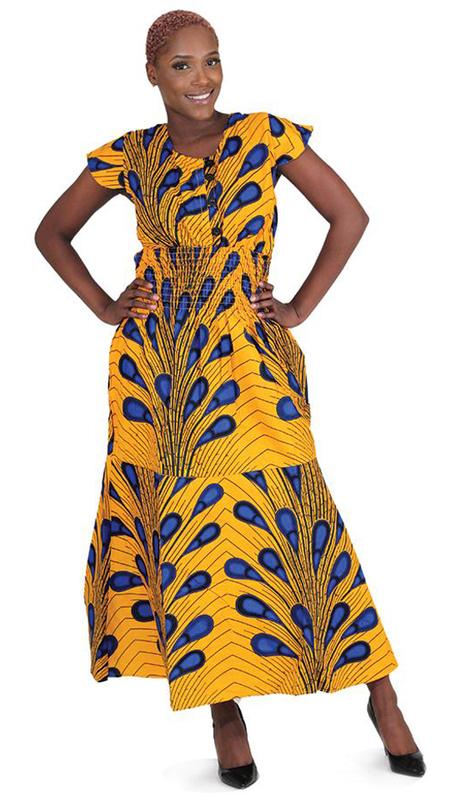 African Print Long Dress. Fits up to 49" bust. 51" length. Comes with matching head scarf. 100% cotton. Hand wash in cold water. 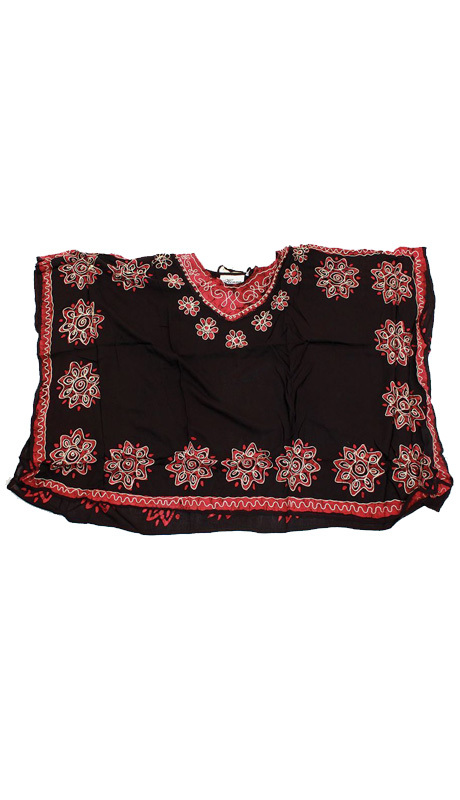 Batik Poncho-Dashiki Comfortable and cool, Has no sleeves and slightly ruffled shoulders and rounded edges. It features a colored stripe around the edges and starburst designs. It is 27” in length and fits up to an 80” bust. 100% rayon. 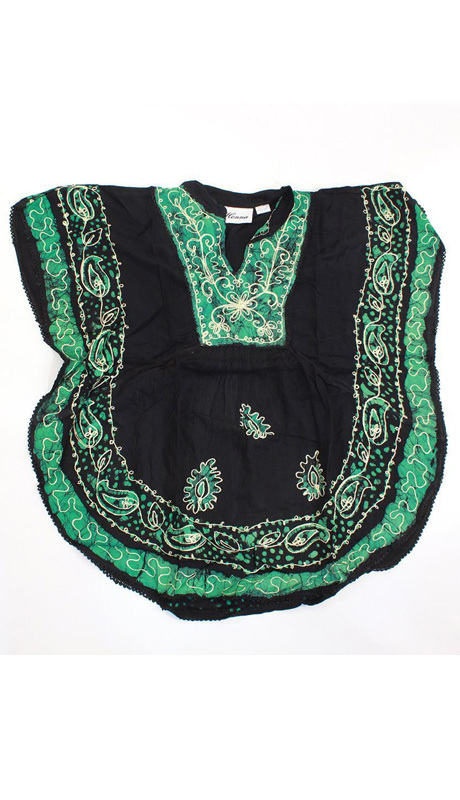 Batik Flower Poncho-Dashiki. Has no sleeves and slightly ruffled shoulders and rounded edges. 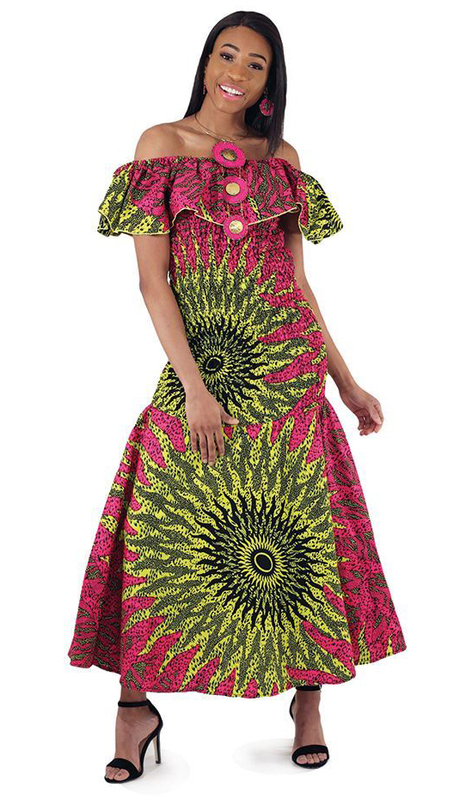 It features a traditional African design of flowers around the edges. It is 27” in length and fit up to a 58” bust. 100% rayon. 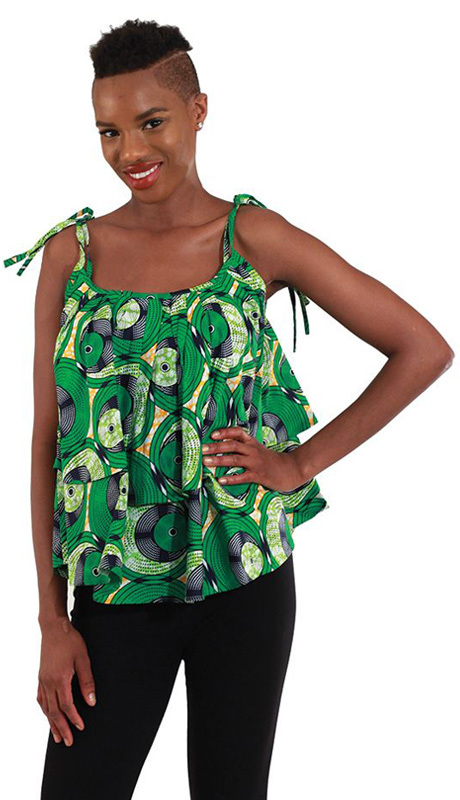 African print tier-tie top. Fits up to 50" bust. 25" length. Shoulder straps. Wash in cold water. 100% cotton. Patchwork Print Shoulder Dress. Fits up to a 44" bust. 38" length. 100% cotton. Wash in cold water.